A painting of a "The Poplars" by Nottingham artist Samuel Parrot (1797-1876) painted in 1848, has been loaned by the Radcliffe on Trent Local History Society to the Grange in Radcliffe, and can now can be seen on display. 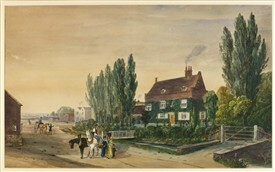 The Poplars was a house in the centre of Radcliffe sited where the current Post Office is located. It was then occupied by John Green and later Butler Parr the maltster and cricketer. The house was demolished in 1938. 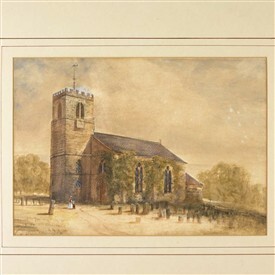 Another painting is of St Mary’s Church Radcliffe on Trent, and is interesting as it shows the old church tower, before the rebuilding in the late 1870’s and the new “saddle-back tower” which can be seen today. We do not have a confirmed artist for this work. This painting is on loan to St Mary’s church by Radcliffe on Trent Local History Society and is on display inside the church. So that we can respond to the many local history enquiries that we receive more efficiently, we are in the process of cataloguing the society archives. We welcome donations of items relating to Radcliffe and villages nearby, including documents, photographs, family history and family memories to add to our extensive collection. Please contact the society Archivist Marion Caunt on the contact details given at the end of this article if you have anything that you’d like to discuss. When the cataloguing is completed we are hoping to hold open days later this year. Radcliffe Carnival : Saturday 13 July at the Grange. The History Society will be having a stall and selling their local history books at this event. This page was added by Marion Caunt on 27/02/2013.